On 27 March, India deliberately destroyed one of its own satellites as a test of their anti-satellite missile system. The so-called "Mission Shakti" shrapnelized the satellite, creating a debris cloud of mostly mm- and cm-sized high-velocity (several km/s) particles. The event took place at an altitude of about 300 km, barely 100 km beneath the orbit of the International Space Station, and thus immediately triggering alerts at NASA and other satellite operators. Indeed, those "speeding bullets" constitute a threat to the safe operations of satellites and thus also for astronauts. NASA Administrator Jim Bridenstine said the anti-satellite weapon created at least 400 pieces of debris, including 60 trackable fragments that are four inches across or larger. Of that total, 24 ended up in orbits with high points above the orbiting altitude of the space station. Over a period of 10 days following the Indian test, the risk of a debris impact with the space station jumped by 44 percent. The energetic EUV and x-ray radiation from solar flares, and the dumping of tons of charged particles into the Earth’s atmosphere by coronal mass ejections (CMEs), heat up the Earth's atmosphere and make it expand. Satellites sense this expansion as an increase in density at the altitude at which they are flying. This atmospheric drag slows the satellite down, similar to your hand moving much slower through water than through air. Due to this drag, the satellite will gradually lose height and –if not raised back to its normal altitude- eventually return to Earth, mostly burning up during its passage through the atmosphere. Hence a solar cycle minimum, with only few flares and CMEs, is a good period for satellites as they can stay much longer in their earth's orbit (see also this newsitem). However, these very same low solar activity conditions also mean that space debris such as from India's test event can stay much longer in their orbit than usual, and thus can pose a threat to the operating satellites for a much longer time. Hence, the timing of the test with the anti-satellite weapon couldn't have come at a worse moment, as we are in the midst of a solar cycle minimum. The figure above (National Research Council) shows the predicted orbital lifetimes for a number of different objects in circular low earth orbits (LEOs) at different periods in the solar cycle, illustrating the importance of cross-sectional-area-to-mass ratio, altitude, and solar activity in determining orbital lifetimes in LEO. First, objects with low ratios of cross-sectional-area-to-mass decay much more slowly than objects with high area-to-mass ratios. Second, objects at low altitude experience more rapid orbital decay than objects at high altitude. Finally, objects decay much more rapidly during periods of solar maximum than during the solar minimum. The particles we are mainly concerned with here are the 1cm diameter aluminum spheres (A/M around 0.05), resembling very well the debris from the Indian event. Taking into account that some of the pieces are somewhat heavier (lower A/M, about 0.005) and have a higher altitude, as well as the current very low 10.7cm solar radio flux (a proxy for the Sun's EUV and x-ray radiation) barely reaching values of around 70 sfu (solar flux units), one can deduce from this graph that the orbital lifetimes of these particles can reach several weeks to months easily, instead of a few days to a week during solar maximum conditions. For this particular case, it is estimated that most of the space junk likely will fall back into the atmosphere and burn up over the next three weeks or so, although some fragments in higher orbits could stay aloft for about a year. This newsitem was loosely based on articles from Phys.org, Spaceflight Now, and Space.com. 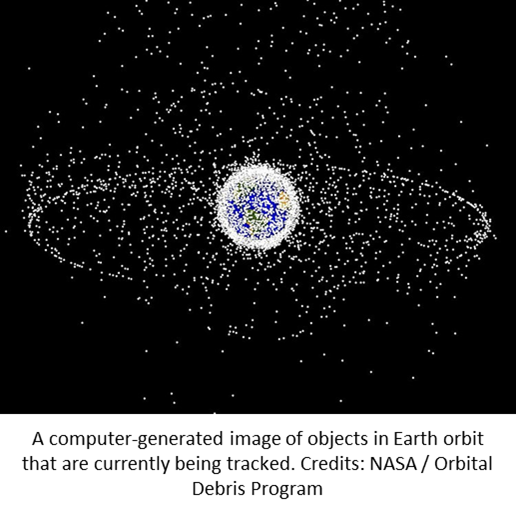 The pictures showing space debris impacts were taken from NASA's Astromaterials Research & Exploration Science (ARES) webpage. More pictures and a complete brochure on space debris can be found at ESA's dedicated webpage. 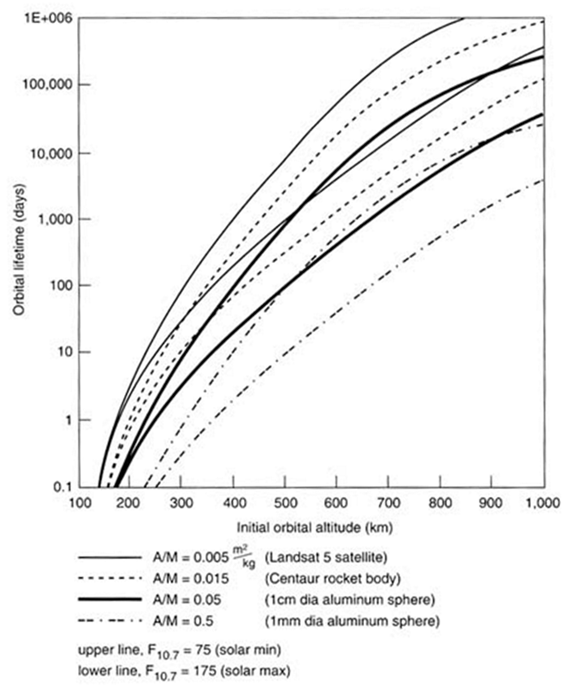 The satellite's lifetime-altitude diagram was taken from National Research Council 1995. Orbital Debris: A Technical Assessment. Washington, DC: The National Academies Press. https://doi.org/10.17226/4765. It's freely downloadable here.